Ba Duan Jin - Shaolin (Gli Otto Broccati) In Italian. 76Kb. Ba Gua Zhang ( Pa Kua Chang): Bibliography, links, resources, quotes, and notes. Circle walking internal martial arts. By Michael P. Garofalo. 60Kb+. Beat Stress with the Eight Treasures. By Faye Yip. 45 minute instructional videotape. Beijing Short Form, Simplified 24 Movements, Tai Chi Chuan, Yang Style. By Michael P. Garofalo. 28Kb+ List of the movements (.html and .pdf), links, bibliography, quotations, and notes. The Bodhisattva Warriors. The Origin, Inner Philosophy, History and Symbolism of the Buddhist Martial Art within India and China. By Shifu Nagaboshi Tomio (Terence Dukes). Boston, MA, Weiser Books, 1994. Index, bibliography, extensive notes, 527 pages. ISBN: 0877287856. MGC. "Born to Move: Qigong." By Linda Shelton. Eight Section Brocade. Natural Health, June, 2004, pp. 40-44. Photographs. Breathing Practices: Qigong, Taijiquan and Yoga (Pranayama) Brocades - Artwork, banners, scrolls, mats. El Brocado de las Trece Posiciones del Qigong. Por Alberto Navarrete Lopez Presidente de la Sociedad Estatal de Taichi "Himpo" A.C. 223 Kb. Chi Kung: The Chinese Art of Mastering Energy. By Yves Requena. Healing Art Press, 1996. 120 pages. ISBN: 0892816392. Includes instructions for Eight Section Brocade. 2 VCDs, Mandarin Chinese instruction; Beijing Youth Audio-Visual Publishing House; ISBN 788304060X. Chinese Qigong. By Guo Yui. 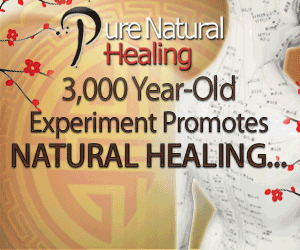 A Practical English-Chinese Library of Traditional Chinese Medicine. Publishing House of Shanghai University of Traditional Chinese Medicine, 1990. Ch'i - The Power Within. Chi Kung Breathing Exercises for Health, Relaxation and Energy. By Geoff Pike and Phyllis Pike. Charles E. Tuttle Co., 1996. 272 pages. ISBN: 0804830991. Section Six, pp. 122-146, on "Pa Tuan Tsin -Eight Precious Sets of Exercises." Chi Tao, Ba Duan Jin Photographs and French descriptions. 14Kb. Cloud Hands - Tai Chi Chuan and Chi Kung. By Michael P. Garofalo. 800Kb+. The Complete Book of Chinese Health and Healing. By Daniel Reid. Random House, 1994. 484 pages. ISBN: 0877739293. Includes a detailed explanation of the Eight Section Brocade. Orr. Produced by Andy Trohear. The Complete Guide to Chi-Gung: Harnessing the Power ofthe Universe. By Daniel Reid. Illustrations by Dexter Chou. Boston, Shambhala, 1998. Appendix, index, 326 pages. ISBN: 1570625433. Cross-Training for Dummies. By Tony Ryan and Martica K. Heaner. Foster City, California, IDB Books, 2000. Index, appendices, 350 pages. ISBN: 0764552376. Notes. Cultivating the Chi: The Secrets of Energy and Vitality. Compiled and translated by Stuart Alve Olson. Revised and expanded third edition. Chen Kung Series, Volume One. St. Paul, Minnesota, Dragon Door Publications, 1993. Index, 166 pages. ISBN: 0938045113. MGC. Dao-yin = Qigong, Chi Kung, Shiu Liao, Nei Gong, Daoist Exercises, Yangsheng or Nourishing Life practices. Discovering Chi. A three part videotape series by Linda Modaro teaches the Eight Treasures. Dao House: Of Discourses and Dreams "A compendium of links to great online Daoist (Taoist) resources." An excellent selection of fine links with informative and fair annotations; all presented in an attractive and easy to read format. The in-depth and creative collection of links are arranged by 18 topics. The 8 Brocade Descriptions for seated and standing forms with drawings. 58Kb. Eight Brocades Resources. Eight Brocades Seated Chi-Kung (Ba Duan Chin). Translated and compiled by Stuart Olive Olson. 8 Pieces of Brocade. Willamette Valley Tai Chi. By Dwight Campbell. 23Kb. Eight Pieces of Brocade-Chi Kung. By Dr. Yang Jwing-Ming. Videotape and DVD. The Eight Pieces of Brocade: Improving and Maintaining Health. By Dr. Yang, Jwing-Ming. 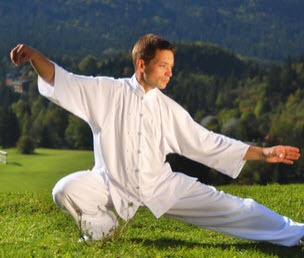 (Ba Duann Gin), A Wai Dan Chi Kung Exercise Set for Improving and Maintaining Health." Includes a glossary of Chinese and English terms. Eight Pieces of Silk Brocade Includes illustrations. Eight Section Brocade. Instructional videotape by James McNeil. Eight Section Brocade Brief instructions with photographs of movements. By Jiawen Miao. 30K. Qigong, and the first eight Buddha Lohan Hands. This document is about 80 pages long. "The Eight Section Brocade: Qigong from the Shaolin Temple." By Gene Ching. Kungfu Magazine, May/June 2001. Eight Sections of Silk. By Joe Hing Kwok Chu. 67K. Information on acupressure massage and stretching movements. This author tries to make the case that the exercise is more accurately related to the "pull and break tendons" exercise set of the Shaolin Buddhist training regimen. I believe that Da Mo's (Bodhidharma) bone marrow washing and tendon changing exercises are not the same as the Eight Section Brocade qigong. The ability of the tendons or ligaments to stretch is very limited, most stretching occurs in the belly of muscle fibers. Eight Silk Movements. Tak Wah Kung Fu Club. Illustrations and descriptions for each movement. 10Kb. Eight Simple Qigong Exercises for Health: The Eight Pieces of Brocade. By Yang Jwing Ming. Eight Simple Qigong Exercises for Health DVD. The Eight Pieces of Brocade. By Yang Jwing Ming. Boston, YMAA Publication Center, 2003. 140 minutes, color DVD5-NTSC - All Regions. ISBN: 1594390037. DVD B00016USR8. Eight Steps of Brocade Instruction on a videotape by Yu Ding Hai. Eight Strands of the Brocade 5K. Monastery, 1999. 299 pages. ISBN: 0924071990. Eighteen Hands Lohan Qigong (King Mui Version) Description and photographs. Eighteen Hands of the Lohan (Lohan Shi Ba Shou). Shaolin history. 34Kb. The Eight Treasures. By Maoshing Ni. 196 pages. An instructional videotape is also available. "Eight Treasures from Old China: Baduanjin - The Eight Brocade Exercises" by Foen Tjoeng Lie. Taijiquan and Qigong Journal, Volume 4, Issue 2, 2001. Eight Treasures Qi Gong By Michael P. Garofalo. 325Kb. Descriptions of the movements, comments, links, bibliography, quotations, and charts. Exercise Danger: 30 Exercises to Avoid plus 100 Safer and More Effective Alternatives. By Grant Donovan, Jane McNamara, and Peter Gianoli. Wellness Australia PTY LTD, 1989, 1997. "The Eye of the Beholder." By David Life. "The practice of Drishti is a gazing technique that develops concentration and teaches you to see the world as it really is." Yoga Journal, February 2002, pp. 73- 76. Feedback or complaints about this webpage? Five Elements and Eight Brocades of Silk. Chi Kung Series, Volume 1. VHS videotape, 45 Minutes. Friedrich, Andreas W: Qi Gong, Ba Duan Jin, Die Acht Edlen Übungen. Power. By Christopher S. Kilham. Healing Art Press, 1994. 96 pages. ISBN: 0892814500. Although this book draws from Tantra and Kundalini yoga traditions, rather than from Chinese qigong, the comments on forward and back bending are instructive. Gil Otto Broccati or Ba Duan Jin. Studion de un'antica pratica de qigong ancora molto diffuse in Cina. By Maria Luisa Vocca. Good instructions, with photographs, in Italian. Includes bibliography. 38Kb. Ginnastica Cinese: Stretching e Pa Tuan Chin. In Italian. 24Kb. Gu Shen Taijiquan. Valley Spirit Tai Chi Chuan. A journal with reflections, notes, suggestions, references, questions and answers, links and quotations about Tai Chi Chuan and Chi Kung. By Michael P. Garofalo. The Healing Promise of Qi: Creating Extraordinary Wellness Through Qigong and Tai Chi. By Roger Jahnke, O.M.D.. Chicago, Contemporary Books, 2002. Index, notes, extensive recommended reading list, 316 pages. ISBN: 0809295288. Health and Long Life: The Chinese Way. An iintegrated survey of Chinese health practices, from acupucture to inner alchemy. By Livia Kohn. Three Pines Press, 2005. Herbalshop - Ba Duan Jin Seated version of Eight Section Brocade. How Can I Get My Product Reviewed or Listed Here? People's Republic of China. Translated by Edward C. Chang. Pennsylvania, Rodale Press, 1985. Index, 202 pages. ISBN: 0878575820. The Eight Section Brocade, Pa Tuan Chin: pp. 24-29. "Longevity and the Eight Brocades." The Empty Vessel: A Journal of Daoist Philosphy and Practice, Summer 2002. Luohan Qigong. Sifu Gaspar Gaspar, M.D. 14 Luohan forms description. Meditation: Links, Bibliography, Notes, Quotes. Buddhist qigong and kungfu, while Mount Wudang is associated with southern China's Taoist qigong and Taiji. The legendary Master Zhang Sanfeng is associated with the Taoist qigong and Mount Wudang. Numerous references to the Eight Section Brocade are found in Wudang qigong sources. Nan Bei Wushu - Chi Gung Some information about making specific sounds while doing the ESB. Las 8 Piezas del Brocado: Ba Duan Jin. Very good instructions in Spanish, with drawings. 30Kb. Las 8 Piezas del Brocado Sentado: Ba Duan Jin. Instructions in Spanish for the seated version. 13Kb. Opening the Energy Gates of Your Body: The Tao of Energy Enhancement. By Bruce Kumar Frantzis. Illustrated by Husky Grafx. North Atlantic Books, 1993. Second Edition. 174 pages. ISBN: 1556431643. Pa Tuan Chin (8 Section Brocade) Information from the UCT Tai Chi Club. 4K. A list of the benefits of each movement. Pa Tuan Chin Includes photos and instructions. In the German language. 15Kb. Pa Tuan Chin Course Norfork, England. Pa Tuan Chin. By H. F. Xue. Wan Li Book Co., Hong Kong. Pa Tuan Chin and Pa Kua German language. Qigong. Kodai No Bushido. 16Kb. Qigong: A Legacy in Chinese Healing - The Eight Treasures. By Dean Deng and Enid Ballin. Qi Gong Ba Duan Jin: Die Acht Edlen Übungen. By Andreas W. Friedrich. Book. ISBN: 3874100618. Qi Gong: Bibliography, Links, Resources. By Michael P. Garofalo. Qigong Empowerment: A Guide to Medical, Taoist, Buddhist, and Wushu Energy Cultivation. By Liang, Shou-Yu and Wu, Wen-Ching. Edited by Denise Breiter-Wu. Rhode Island, Way of the Dragon Publishing, 1997. Index, glossary, 348 pages. ISBN: 1889659029. This is an excellent reference and instruction book. Qi Gong for Beginners: Eight Easy Movements for Vibrant Health. By Stanley D. Wilson. MGC. Very good photographs, clear descriptions, useful supplementary information and instruction. Qigong Teachings of a Taoist Immortal. By Stuart Alve Olson. 12K. Qigong Teachings of a Taoist Immortal: The Eight Essential Exercises of Master Li Ching-Yun. Brocade, the "Eight Diagram Active Kung" by Li Ching-yun (1678-1934). The photographs and explanations of the movements are very good. The layout and illustrations are exemplary. The introduction, notes, and comments are very useful. Persons interested in qigong and taijiquan and their relation to the Eight Tri-grams and I'Ching will find Mr. Olson's many books invaluable. Quest for Longevity: A Taoist Perspective By Francesco Garri Garripoli. 31Kb. Relaxing Into Your Being. The Water Method of Taoist Meditation Series, Volume 1. By Bruce Kumar Frantzis. Fairfax, California, Clarify Press, 1998. Reader's Edition. 208 pages. Republished by: North Atlantic Books, 2001, ISBN: 1556434073. Sifu Frantzis's lectures on "dissolving" are important for the Wu Ji meditation posture. Relaxation (Sung, Song): Links, bibliography, quotes, notes. Rochester Chen Taijiquan Ba Duan Jin Excellent and clear instructions. 15Kb. The Root of Chinese Chi Kung: The Secrets of Chi Kung Training. By Yang Jwing-Ming. YMAA Chi Kung Series #1. Jamaica Plain, Massachusetts, Yang's Martial Arts Association, 1989. Glossary, 272 pages. ISBN: 0940871076. MGC. San Francisco, 1990. Index, bibliography, 351 pages. ISBN: 0062502328. MGC. Seated Version of Ba Duan Jin Seated version of Eight Section Brocade. Herbalshop. The Secret Art of Seamm-Jasani: 58 Movements for Eternal Youth from Ancient Tibet. By Asanaro. Jeremy P. Tarcher, 2003. 210 pages. ISBN: 158542241X. Some speculate that general Chong Li-quan might have learned some yoga/qigong from Tibetans and Taoists living near Tibet. Shaolin Ba Duan Jin In the Check language. 15Kb. Shaolin Ba Duan Jin. Brief directions for each movement and larger instructive photographs of a demonstration of the form by Shi Xing Xi, Shaolin warrior monk and head coach. Shaolin Eighteen Lohan Hands. By Sifu Wong Kiew Kit. 14Kb. Compare the first 8 movements of 18 Lohan Hands with the Eight Section Brocade. Includes illustrations of movements. Comments. Have You Ever Wanted To Achieve A State Of Total Relaxation But Never Believed That Yoga Was For You? 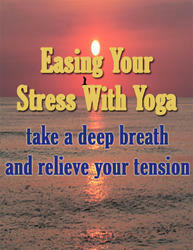 Has the stress of daily life made you tense, uptight and too wound up to be able to think clearly? If so, then you are not alone. 40 of Americans feel that their lives are too stressful and over 60 of Americans say that they find themselves in situations where they feel lost at least once a week. How old is 18 buddah hands exercises? What are the Baduanjin (8 Pieces of Silk Brocade)? What are the health benefits of doing 8 pieces of brocade qi qong? Are the eight strands of brocade exercise dangerous?